ALPHA Bank wanted to provide customers with advanced mobile banking user experience on the Windows Phone platform, in no less than 3 months. Alpha Bank in Greece is one of the country’s leading banks, with over 1,200 branches in the Balkans and Cyprus and over 16,000 employees. 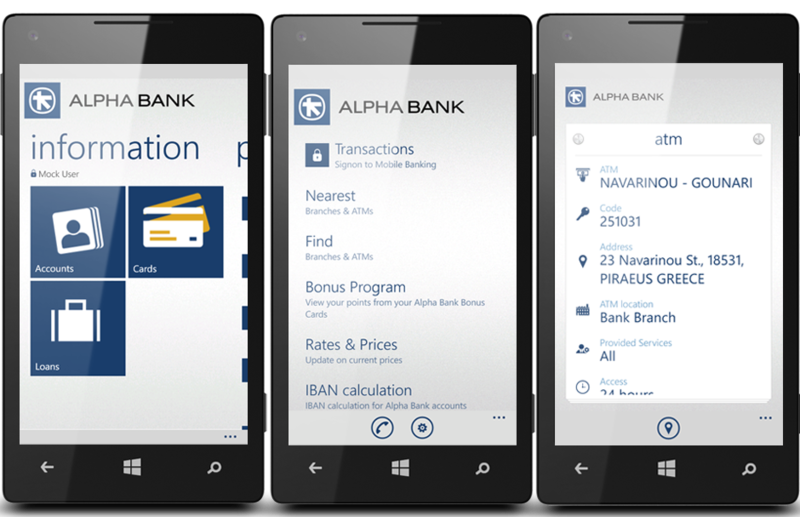 With a reputation for being at the forefront of technology development, Alpha Bank wanted to provide customers with advanced mobile banking user experience on a Windows Phone platform. Alpha Bank wanted the Windows Phone 8 app to integrate with its existing web banking platform. This meant integrating with an existing Microsoft-based stack driving the current web banking solution. The aim was to ensure users could benefit from a fluid and intuitive experience for retail electronic banking transactions. Using experience gained from years of Silverlight frontend development, the Indice team delivered the Windows Phone 8 app within three months. The Windows Phone 8 app carries out a wide range of retail account transactions as well as providing access to related services such as savings accounts, cards and loans. It also supports profile management scenarios, along with publicly available functionality such as location services, IBAN calculator and call center support integration. Location services were introduced to help users find the nearest ATM or physical branches. Customers can also access their email account(s) to send transaction information. They can also be put in touch directly with a call centre. Alpha Bank’s IT department is also assessing additional features for future versions. These include the use of the phone’s camera to enable bar code reading on bill payment notes. Other areas of development are focused on targeted marketing activities by exploiting the push notification technology available in the Windows phone platform. The application has been built upon concrete security practices and utilizes a two-factor authentication security scheme. A further level of security includes encrypting and signing messages between the phone and back end services, making message tampering and data sniffing impractical. The app was received with the warmest user reviews. You can check it out here. Read the Microsoft case study here.